CAMINO-108S is a smart combination of AMEC AIS Class B with our latest antenna splitter. It allows you to share a single VHF antenna with DSC radio, which simplifies installation and reduces cable runs. The unit is designed to provide high performance and great reliability, resulting from our year long field experience. It contains 1 VHF transmitter, 2 AIS receivers on 2 VHF channels and 1 MCU with cutting edge software defined radio technology. Chart plotter and PC can be integrated with ease over its NMEA2000, NMEA0183 or waterproof USB port. CAMINO-108S supports “Dual GPS Backup” to enable GPS input from both NMEA 2000 and NMEA 0183. This feature actively backs up your external GPS antenna to ensure the positioning and transmission of your AIS transponder. 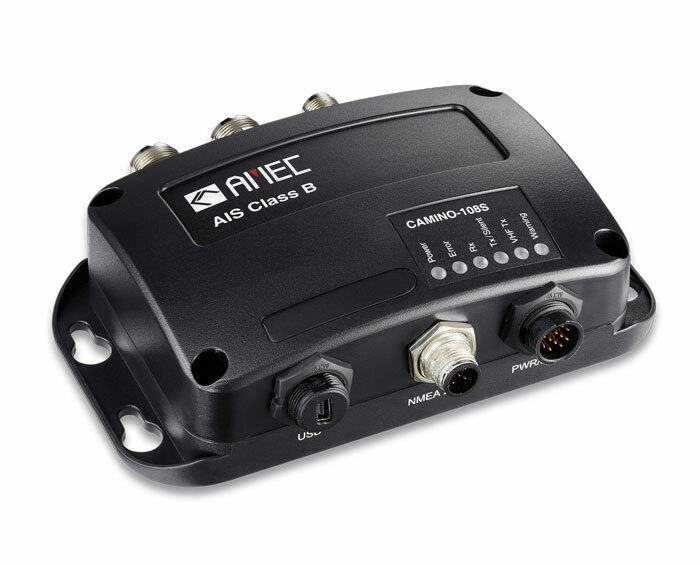 The built-in splitter featuring zero insertion loss on reception path and ultra low insertion loss on transmission path ensures optimized range of your VHF radio and AIS device. The built-in test function gives a simple diagnosis in the event of antenna problem. Its fail-safe feature guarantees priority to VHF radio operation even if the splitter has power failure.